Very good and original! From the beginning with those cool looking tanks, bombarding the mountain to open a passageway to the enemy base, to the end camera sequence deliberately similar to the �Hindenburg� crash and the original line of the reporter �Oh, the humanity!� � everything is well planned. The outside of the zeppelin is well done, but the inside is kinda bleak. The support beams and the walking paths through the zeppelin�s body are nicely done and textured but the passenger area is bland. I wondered what kind of gas is this that stays inside with so many leaking holes. Maybe if there were some double hermetic doors or something, it would�ve looked more convincing. Also why is there low gravity inside the zeppelin? 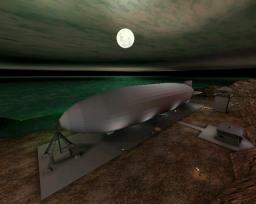 The gas lifts the zeppelin but it is because it is trapped and is lighter than the air. To the objects inside it wouldn�t matter because they are heavier than the gas. Anyway it is a map intended for fun not for studying physics, so we can suppose it�s some new gas with very strange behavior. 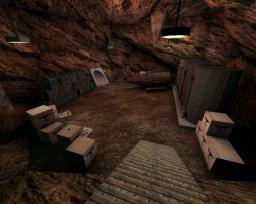 The map has some drilling machine which I�ve seen in an older map called DM-Dig by one of the authors � Taco. It was I nice reference to see, that old map had some cool ideas but the map itself wasn�t very well executed. Bots seem to navigate the map without problems with the only exception that they tend to shoot the targets instead of touching them. So they�ll deplete all their ammo first and then when they are left with the impact hammer they go near the engines and the bombs get triggered. By the way, that song that plays in the end is something From �Led Zeppelin� I suppose. I�m not familiar with their music but it would make sense if it is. Heh, this is definatly on my list of "Decent" Assault maps. -It runs a little slow, kinda laggy. But Is possible it isn't due to the size of the map, but to the suckage of my computer. -A tad hard to navigate through and follow, especially inside the Zepplin. The first two engines are somewhat easy to get to, but the other two deeper in the Zepplin, it's easy to get lost. -Love the end cinematic. Not sure If I am old enough to remember the event itself (If I was, I was probably very young and don't remember) But still a fun map to play. -Love the attackers spawn place, too. Very original. -Well, the whole map is quite original. Well done. Never would have expected a map like this. Terrific! This level had me involved right from the start. With possibly the most inspiring begining of any assault (doors in your tank open to let you out, then the tanks blast a hole through the hillside), I came charging into battle to save Private Ryan or something of that nature. Atmosphere is very good, with a very custom feel to the level, and while the lighting especially could have used some luvin', the visuals were really quite cool. Custom textures and some great architecture in the blimp, as well as good (for UT99) terrain helped spruce the place up,and I didn't detect any BSP errors in my brief run-through, suprising considering the many unusual curves in the zeppelin. Gameplay had some loopholes, but was enjoyable nonetheless. I think the biggest problem was the extreme chokepoints. Opening the blimp ramp is very difficult, since this requires penetrating then entire enemy team to enter a tiny room through one entrance. Destroying the engines in the zeppelin created a similar problem. Still, I found it suprisingly fun to cram myself into a doorway and gun down the "nazis" on the other side. When inside the airship, I did have some trouble figuring out whether I was running toward the front or the back, and it is important to know. I would have liked to see some more indicators of direction/location inside. Bots did some funny things, but they're bots, and they still almost beat me, so I won't complain. All in all, I would rank this map a solid success. It's not your typical assault fare, but that's part of what makes it appealing. Whoa! This is UT Assault taken to a new height! After 5 or more years, we've all become more than a bit jaded about our expectations of what a UT map should look like and how it should play, but AS-Zeppelin delivers the goods and then some. This may be the best looking UT map I've ever seen, and that includes the muted gray tones of the Zeppelin itself that harkens back to the black and white photos and films of the 1930s from which this map was obviously inspired. The level of detail throughout the map is impressive, especially the Zeppelin itself with all the compound curves, tons and tons of structural girders and those long windows in the passenger compartment. The Docking ramp is the most detailed Mover I've ever seen. The two tanks (personnel carriers?) at the start of the map are WAY cool -- they rumble and clank as they sit there idling and the working exit hatches are impressive. When the main cannons start firing, the sounds and explosions are very realistic (and deadly, if you get too close!) and I noticed that Bots wait for the firing to stop before running up the hill. Those cannons have a very realistic recoil action that I've never seen in any UT map before. Of course, in the heat of battle, such details might be overlooked, but they still seem to register on a subconscious level and serve to immerse players more deeply into this map than any other. I noticed lotsa custom textures, all very high quality and consistant with the overall care this map was given by its creator(s). The gameplay is subtly enhanced over that of any other Assault map I've played. It took a while for me to figure it out, but instead of the simple objectives of other Assault maps, this one requires the setting of "delayed fuses" on explosives to destroy the engines and gondola of the Zeppelin. The fuses have 5 second timers and the Defenders can defuse them within that timeframe, which makes for some new and interesting team strategies. The ability to fuse and unfuse the explosive devices breathes new life into the Assault gametype. And wait until you successfully complete an attack on the Zeppelin! The ending sequence that plays out is 2nd to none -- the Zeppelin catches fire, explodes, and breaks loose of its docking clamps amidst the (loud) sounds of a very familiar Led Zeppelin tune! Obviously some very special tricks or programming were used to create this end sequence because no other map comes close to it. I'm giving this map a 9.5 because I am still holding out for a perfect 10 and because I noticed Bots have a minor difficulty setting the explosives, but otherwise, I am in love with Assault all over again, thanks to AS-Zeppelin! Played this one this weekend and saw the blimp was from another map by Dawn called DM-DawnsAlpenUberfall. I have been playing Dawn's DeathMatch Palace Server for maybe like 5 years now and I have chatted with her alot. Went there today and she was online so I asked her so she told me about AS-Zeppelin. She said the original idea was from Taco and she made the Deathmatch version as a rampup to making the Assault version. Taco made a map called DM-Dig and Dawn still runs it on her server, that's why the drilling machine like tgm79 said. AS-Zeppelin has lots of additions and improvements to the blimp as well as being a specially coded Assault map because she writes her own code, too. I already found AS-Zeppelin playing on 3 assault servers so I guess it's getting real popular fast! You should check out all her other maps, some are pretty weird but all of them are very cool and original. Some of her maps are famous, like they run on everyones deathmatch servers like DM-DawnsSniperHeaven, DM-DawnsMonument, and Dm-DawnsRoulette and some others. I like this map because I don't think there any good Assault maps people are making anymore and this one rocks! 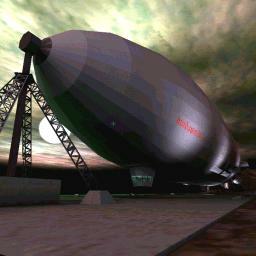 I wish she would make all the changes from this blimp to the one in her deathmatch map cuz this is way cooler. I played with some other guys that like Assault too and they all said this was gonna be their new fav assault map. I kept defusing the bombs or whatever and it was pretty funny. I wish I could vote 11 or 20 or something for this map but everyone always says there is no "10" at least yet and that makes me think this could be it but I'll give it a 9 anyway. And go to her server which has been around since UT started and you can talk to her too. Its called Dawns Deathmatch Palace or close to that and otherwise you can try 64.37.120.172:7777 which should work for sure. sweet, This is a cool map to play with bots and with other people. I like the drilling machine, taco. Overall this is just a fun UT map, keep up the good work dawn knight and taco. Classic AS map. Well done. Cool map, with plenty of orininality. LOL the end (assume music is Led Zep, correct me if I'm wrong, I probably am). Perhaps the bot pathing could be altered to give a little more emphasis for the bot defenders on holding the mine as well as the loading rapm control. No bots stopped me from getting thru here, so was able to complete the map without a firefight :( Love the low gravity in the Zep, if totally unrealistic. As said above, it isn't a physics study though, so not really a prob. Perhaps the inside of the gondola could be jazzed up too, 'tis a little bare. All in all, a good AS map.